It's summer reading time! That's when we get to catch up on what's new and exciting in publishing. Our summer reading list is primarily recreational. It's purpose is to connect our learners with resources they may enjoy. We keep the list pretty short - at about fifty books so as not to overwhelm. We are mindful of genre, "boy books", "girl books", and themes in diversity. We focus on contemporary publications - the last two years or so, but we also include a few classics. We aim for balance between young adult and adult literature. Keeping in mind that our library users include young teens and adults, our list is thematically comprehensive. Not every book is for every library user. Selection is part of the reading proces and we encourage young readers to be reflective about their choices - to contextualize them with their personal and family values - to read reviews and publisher notes, to make predictions about whether a book will suit their interests, and also to switch to a different book when one falls short of their expectations. There are so many books to enjoy. Summer is not the time to slog through a book that holds little appeal. 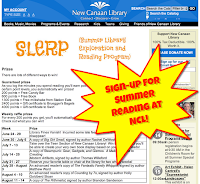 As in previous years, New Canaan (town) Library runs a dynamic Summer Library Exploration and Reading Program (SLERP). Mallory Arents (@MLArents on Twitter) will facilitate that program this year. In our reading list, we've linked our titles to the town library collection's titles so that New Canaan Library users can participate in conversations about their reading. 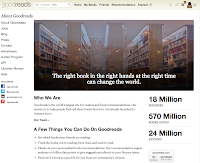 We are also experimenting with GoodReads - which is a social book recommendation site. We've dabbled with different products for online book discussion for years - first VoiceThread, then Destiny, then the town library website, but we want to provide our readers with an opportunity to document their reading experiences in a portal they can "take with them" once they leave New Canaan, and this one is well established. So we've set up our summer reading list there. There's an app for that! 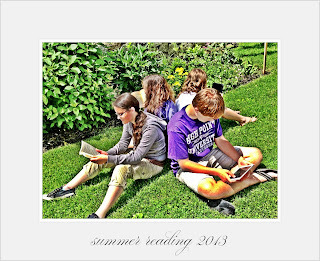 Summer may also be a good time for readers to experiment with digital reading. Downloading eBooks to electronic devices can be tricky, and a rainy summer day may present just the right opportunity for readers to explore digital content. Granted, many digital readers are not particularly practical for the outdoors, but digital reading is becoming increasingly important in K-12 learning, and it is helpful to have some experience with it. Finally, we encourage our library users to contribute to the summer reading list. We are happy to add titles! Just keep the criteria in mind. As much as we love The Hunger Games, and The Art of Racing in the Rain, those books have been around for five years, and they already have ample circulation. We want to introduce readers to fresh content, so that we can grow our Vide Collection (New Canaan High School's Book Group collection) with newly discovered titles.